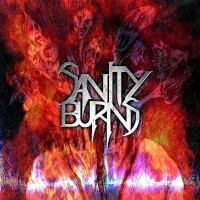 SANITY BURNS is a young, London-based Heavy/Thrash Metal band. Bassist Don Merritt is the only surviving member since the founding in 2007 as AS SANITY BURNS BLACK. When guitarist James Phoenix joined, Don switched to bass (he was guitarist) and so the new, shorter name was adopted. Steadily the line-up got completed. SANITY BURNS played several gigs, including Emergenza Festival and Battle for Bloodstock and made it to the finals of the latter. Drummer Hugo Terva joined in 2010, the year in which the band shared the stage with SUBVERSION and TESSERACT in Camden’s “Underworld”, and supported ONSLAUGHT in Maidstone. The band’s self-titled debut album was self-released, came out in June 2012. Only recently did vocalist Chris Simmons leave the band. In the meantime a replacement has been found: Richard Ashton (AXIS OF EVIL, RITUAL ABUSE, HOLLOW DEMISE). I don’t know how his voice sounds, but somehow I hope it will fit the music better than Chris’s voice. Anyhow, the self-titled debut… It begins with “Relentless”, a Thrashy song with a galopping rhythm at first. Add vocals and you can easily think of TESTAMENT, DEATH ANGEL and similar. The chorus is played at midtempo, which also makes it distinguishable from the verses. Of course, it’s not just that, also the music is different. Another speedy outbreak kicks in later on, in typical DEATH ANGEL style, followed by the obligatory guitar solo. Oh yes, for the riffing, you could say that James listened carefully to Jon Schaffer from ICED EARTH. All in all, a very good start. “Eternity” doesn’t begin in a direct way, rather the intro creates tension, helped also by group vocals (“hey, hey, hey…”). And then the Metal kicks in, again DEATH ANGEL Thrash. The midtempo bridge reminded me – if you’ll excuse the name-dropping – of the UK Heavy Metal band FURY UK (now in the fridge as bassist Luke Appleton is busy with ICED EARTH and the other guys formed ABSOLVA), while the chorus is a pounder with clean vocals. And that’s nice for a change, the clean singing. Otherwise the lyrics are sung in a screamy way. It’s Thrash, so there’s logic in this way of working. A slow, dark and evil sounding vocal part precedes the holy solo moment, after which it’s back to the chorus and heading towards the end of the song. Another good song, in short. “Killed In Action” is next and another highlight, in my opinion. A direct start, also featuring guitar bursts, added with rough, vicious vocals. Drums play a rapid, rather Bluesy beat. Things get Thrashy and vicious in the bridge, while the straight-forward and fast chorus reminded me old EXODUS. Even the solo sounds old school. A job well done! “Fracture” is one of the lesser songs. Not bad, but not all is as good or attractive. The music is midtempo Heavy / Thrash Metal with growling vocals. A touch of melody would not have hurt here, as the balance between guitar and vocals isn’t right somehow. Contrast is created by the clean bridge, where the singing isn’t that good, to be honest. This part then links up with the pounding, melodic chorus. The screaming vocals annoy, if I may say so. Maybe screams do fit here, but then it’s the timbre that’s not right. All in all, the music is alright, yet the vocals seem to be the biggest “problem”. Time to take a break then. The ballad “Embers” is perfect for that. It’s an acoustic song with vocals that reminded me of Rob Halford or Tim Ripper Owens. Not the high screaming, but the regular singing. And no, it’s not an exact comparison, the singing just sounds similar, which is good. Not all vocal input is bad, in other words. When the (electric) solo is played, strings play in the back, to create the right atmosphere and feel. Another fairly good song, though no highlight. Carrying on with the Metal, here’s “Ashes”, a song that reminds heavily of METALLICA and similar. The vocals, obviously, have a rough edge here. The bridge brings out the melody of the music, while the chorus is very well done, albeit preceded by a clean piece with growls in the back (probably the pre-chorus then?). A calm, acoustic piece breaks the song in two before power is restored. Yes, another highlight it is. Pedal to the Metal once more with “Massacre”. Actually, the title does kind of say so. Like before, think DEATH ANGEL, EXODUS and alike. The rough vocals are back as well. The chorus is a little slower, but still powerful enough. Before the solo, a dark piece is played. Musically, ok, but those growls…. Afterwards, the chorus returns, while Chris sings over the solo at the same time, which doesn’t fit here. “Black Widow” takes a midtempo start, to then shift into highest Thrash gear… with growling vocals. Why? The melodic chorus is then better, with the clean singing (and of course the music). So far the song has a good vibe and drive. But when the solo part nears, things change. First the music goes from straight-forward into Thrash, followed by that solo, where again the drums change. Dark rebuilding follows, but when you would expect a repetition of the first part of the song, you get a breakdown. Or in short: this song has too much change in that it’s like bits and pieces pasted together. It’s hard to understand it. “Shitfaced” takes of slowly and you kind of know that something else will follow, that this tempo will not be maintained. So yes, Thrash time! To be short: the music is alright, there’s room for solos, but the screamy vocals annoy. I’ll repeat what I said earlier: perhaps screams do fit here, but the timbre should be different. Last but not least, the longest track on this album, “Schizophrenia” (more than 7 minutes long), is due. It begins with acoustic music, shifting into midtempo Heavy Metal and so gradually faster. The vocal input consists of growls and clean singing. The Thrash influence is set in the middle, while the last 1/3 of the song consists of silence, before acoustic music comes to the front again. All in all, a decent song to end with. For a first album, though self-released, SANITY BURNS have done quite a good job. I have to acknowledge the enthousiasm, the vibe, the energy and old school character of the songs. Kudos for that. However, not all is that good, especially two aspects: 1) the screams/growls which didn’t always have the right timbre or were used too often, and 2) trying to cram as much as possible into one song, which makes it sound like a collage… without direction. But on a whole, these are rather small problems. This debut album is very decent, there’s good stuff on it and it can only get better from here. Very well observed… to be fair the “tinny” production really did kill the timbre on my vocal and the producer being new to the genre was encouraging to get me to sing the way it unfolds on the album. Check out the old demo’s on youtube somewhere to hear them tracks where the mix sounds correct. Richard will do a fine job, he’s a top guy and brilliant vocalist.